What are the different types of motorcycle helmets? What is the structure of a motorcycle helmet? What are the characteristics of a good motorcycle helmet? Did you know that the human skull is so fragile that it only needs a kinetic energy of about 4.5 Kg/m to break it? Do you still know that more than 70% of people who suffer traffic accidents have head injuries, and that the majority of deaths caused by motorcycle accidents are mainly due to not wearing a protective helmet? Clearly, the head is the element of the human body most exposed to the risks of trauma associated with road accidents, but fortunately, with technological progress, we can emerge intact, or at the limit with minimal damage, from accidents as violent as the most dramatic collisions, provided that the force and severity of the impact are reduced and its impact is distributed by modifying the structure and surface of the contact. This is why it is important to wear an effective protective helmet every time you ride a motorcycle. In addition to its legal obligation, punishable by a fine and the withdrawal of licence points in the event of non-compliance, the wearing of a motorcycle helmet is vital for every motorcyclist – man, woman, or child – as well as for the passenger to protect his head in the event of an accident. Therefore, it is essential to opt for high-performance equipment that is certified and offers all the necessary protection guarantees. How to choose your motorcycle helmet among the different types of motorcycle helmets? This is the question we will try to answer in this mini-guide. Whether you need a helmet for high-end motorcycle brands like Harley, BMW, or others like Honda, Aprilia, Benelli, Kawasaki, Yamaha, or KTM…etc, your main concern must be safety and compliance with legal approvals. Indeed, the store is full of models and types designed specifically to meet the needs of the most experienced motorcyclists as well as beginners men, women and children! Indeed, we can distinguish 4 main families of helmets with several variants and mergers, each of which certainly has its advantages but also its disadvantages! Undoubtedly, it is the equipment that best protects the head and neck. Especially since it is completely hermetic. This type of helmet is ideal for long journeys and for fans of sports bikes with medium and large capacities known to reach very high speeds. Especially since it is the most effective means of skull protection known today. Complete head and face coverage including forehead, jaws, and chin, and a significant reduction in the risk of trauma. Very good sound insulation even at very high speeds. Very stable and protects well against wind, cold and rain. It also protects against gravel splashes and insects. Very aerodynamic, it reduces air resistance and subsequently offers a more comfortable ride while relieving the neck. Very practical on the roads straight, such as highways for example. Painful to wear during periods of high heat. Too heavy and cumbersome compared to other types. Limited peripheral fields of view. Provides a feeling of claustration. Less practical in urban areas. It is a basic and cheap entry level type. This open front classic is very popular with motorcyclists, and ideally designed for urban use when riding scooters or small and medium-duty motorcycles. There are several variants such as half jets, bowl headphones, and micro jets. Perfect for urban environments and at low speeds. Pleasant to wear, especially in summer, it offers better ventilation thanks to its forward opening (no chin strap). Available in a wide range of choices. Economical in the entry-level segment. Very wide fields of view. Protects the upper part of the head well. User-friendly, provides a feeling of freedom and open space. Provides the opportunity to communicate freely with other individuals without having to remove it. Inadequate protection of the face and jaws in the event of a fall or frontal impact. Poor protection against wind, rain, insects, and gravel spills. Not practical to wear on long trips and to high speeds. Also called “flip up” or modular helmet, it is actually a system with a removable chin strap that tilts backwards to allow the face to be discovered. This type perfectly combines the advantages of the integral and the Jet. Especially since it is versatile and allows mixed use in the city and on long journeys. However, you must check carefully if this equipment has a double “P/J” approval to be able to drive in accordance with the law in a raised chinrest. Multifunctional, allows dual use in town and on motorways. Easier to put on and handle, especially for motorcyclists who wear glasses. Aesthetic, gives a real pilot look! Too bulky and heavy to carry because of the tilting mechanism of the removable chin strap. Reduced protection in the open position. More expensive than the other guys. With its extravagant look and visibly advanced compact chin strap, this equipment is perfectly suited to extreme driving conditions on the slopes. Also known as a cross country helmet, it is a system designed for endurance and sportsmanship, which limits its use in non-urban environments. It should be noted that some brands such as Lazer, Shoei and Arai offer variants adapted and approved for specific use on roads. Lighten and protect the entire skull well. Provides a very good level of ventilation. Poor protection against cold, wind, and rain. Requires the use of additional glasses. A motorcycle helmet is mainly composed of an outer shell and an inner cap. The outer shell is the first safety element, and its main mission is to prevent any external object from entering the interior of the helmet while attenuating and dispersing the intensity of the impact before reaching the inner part. Manufacturers make hulls with several materials, which largely defines the quality, weight and therefore the price of the equipment. Thus for the entry level they use resistant synthetic plastic for cheap and cheap motorcycle helmets. On the other hand, for the high-end segment, they introduce lighter and stronger materials such as composite materials and carbon or glass fibres combined with special resins. The inner cap contains a protective padding and provides most of the shock absorption and head support. Made mainly of polystyrene, this foam is the key element that protects the head in the event of an accident and makes it possible to avoid, or even reduce, head injuries. The loop D: offers the maximum of locking security and avoids tearing despite the relative complexity of its use. The micrometric loop: this type of closure is very practical and simple to use, it is in fact a matter of introducing a toothed tongue into a suitable locking system. The clip buckle: simple to use, adjustable and adjustable, however it presents a risk of loosening, which means that its use is limited for entry-level headphones. The outer cap must be compact and hard. The helmet must contain an earmuff, neck protector, visor and screen. It must be comfortable to wear and contain an adequate ventilation system. It must not affect hearing ability and must allow a 180° field of vision. The interior must not have any sharp bodies that could injure the head in the event of an impact. The assembly must be rigid enough to prevent the components from detaching in the event of an impact. The locking system must be supported under the lower jaw. The chinstrap must be adjustable. 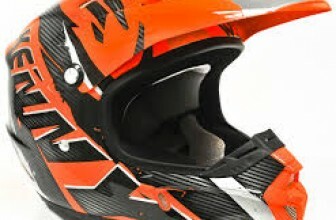 The materials used in the helmet must be resistant to shocks but also to natural conditions such as sunlight, bad weather and high temperatures. It must bear a white label sewn inside displaying the letter E followed by a number indicative of the country in which the operation took place This label must also mention the standard in force attesting to its certification. Before buying, try the helmet to make sure it fits snugly around your head and is large enough to wear comfortably. Avoid choosing a helmet that is too large because the foam will shrink after a few months of use to leave additional space between the head and the helmet that may cause instability of the equipment on the road. In addition, visually check the assembly for any signs of denting or scratches. Choose a new helmet and avoid buying worn equipment, you cannot know if the equipment has suffered a major impact that will reduce its protective capacity. Remember that it is almost impossible to detect internal deformation of the cap and protective padding components with the naked eye. Choose brands that are recognized in the market for their reliability and compliance with safety standards. 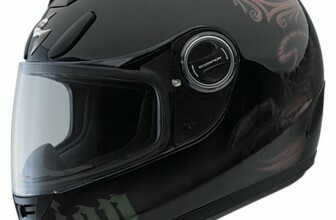 For example, for high-end brands, manufacturers generally offer their own motorcycle helmet brands such as BMW, Kawasaki, or Harley-Davidson. For other mid-range and entry-level brands, helmet manufacturers offer a wide range of models and styles to suit all tastes! 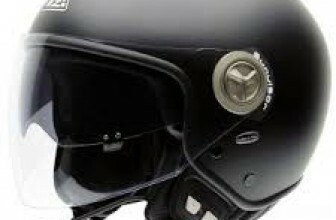 Some examples are: Shoei, AGV, Airoh, Arai, Shark, Viper, Bell, Caberg, Lazer…etc. Make sure to affix retro-reflective stickers with a minimum surface area of 18 cm2 each on the 4 sides of the helmet, i. e. the front, rear, left and right side. These are the following a legal obligation punishable by a fine and the withdrawal of licence points. Check the date of manufacture of the helmet and make sure it is a recent date. As you well know, standards change frequently and by buying very old equipment you risk not only being overtaken by standards and driving illegally but also you risk not being reimbursed by accident insurance. Especially since the older the caque is, the less efficient it is, this is due to the natural compaction of the anti-shock components. Make sure to change your helmet at least once every 5 years or possibly after a crash or fall. Indeed, the inner part composed of the foam collapses and deforms, therefore, it becomes less effective in ensuring its quality as a shock absorbing support. Also, buying a new helmet allows you to anticipate changes in standards and be up to date with new protection technologies. Wear the helmet properly and attach it securely to ensure the highest level of safety. Remember that with a detached helmet you run the same risk of punishment as if you were not wearing the helmet! Avoid using alcohol to clean your helmet, it may alter some of the materials that make up the visors. Remember to equip your helmet with practical accessories such as the nose guard and bib to prevent fogging and ensure a better driving quality. With technological progress, it is now possible to set up and configure a Bluetooth system to stay connected while enjoying the pleasure of driving! Finally, here is a very interesting English-language website from the British Government http://sharp.direct.gov.uk . It presents a relevant evaluation and rating system based on the results of a series of 32 different tests to better help you choose the right helmet by focusing on the most important side that should define a motorcycle helmet, namely safety and protection! 2016 kaskrider.com . Tous droits réservés.